The California Democratic Party passed two marijuana reform resolutions at its Executive Board meeting in Costa Mesa on July 21, 2013, including a call to end raids against lawful medical marijuana providers. These are official positions of the state party set into a form that will hold sway with Democratic elected officials and candidates and they also add a new level of mainstream approval for medical use and cannabis law reform. The first resolution calls on President Obama to respect Colorado and Washington voters and not allow any federal interference in the enactment of state marijuana legalization initiatives, to end federal raids on patients and providers in medical use states and to appoint a commission to study national marijuana law reform. Almost nine months after Colorado and Washington voters passed the world’s first two marijuana legalization laws, and after being repeatedly asked what the administration’s reactions will be, Attorney General Eric Holder continues to state that information will be released … soon. While polls show a majority of Americans want marijuana legalized, there has been little organized pressure to support the process. That first resolution puts the California Democratic Party, the largest state Democratic Party in the nation, firmly on the side of states that seek to legalize and regulate marijuana. The state party joins the national Conference of Mayors in asking the President to end federal interference in state medical marijuana programs, and to end the raids. This kind of political pressure can influence the President as well as elected US Congressional representatives who are voting on a number marijuana law reform measures that address the problems caused by the differences in state and federal law. Party activists hope these resolutions will help counter the enormous pressure under which Obama has been placed by local, state, national and international police agencies efforts to undermine and torpedo the rule of state law. The second resolution aligns state Democrats with bills already under consideration in the state legislature. The Party endorsement of statewide regulation guidelines for cities and counties could help get a few of the wavering Democrats to take a stand. Over 80 resolutions were considered and marijuana was not a contentious issue. The most contentious issue was oysters. 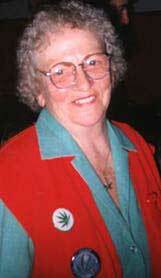 Both the cannabis resolutions were sponsored by the Brownie Mary Democratic Club of Riverside County and endorsed by the Riverside County Democratic Party and other Democratic clubs and organizations, as a perfect example of how working the grassroots can grow into statewide and eventually national support for marijuana law reform. The turnout of Brownie Mary Democratic Club members and other advocates at County Central Committee meetings was instrumental in getting their endorsement. Getting it to the State Convention and Executive Board and eventually passed took the work of many Democratic activists throughout the state. This high level of networking shows that the political process will work for those who work within the political process. For more information on the Brownie Mary Democratic Club, how to form a local Democratic club and how to get involved in the political process to make a real difference, visit browniemaryclub.org.